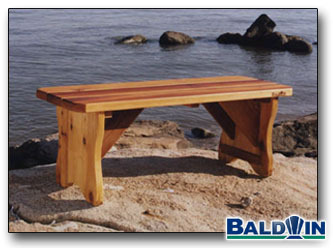 This rugged cedar bench is beautiful and durable. This Bench is at a comfortable height for sitting, eating, even sunbathing. It suits our 54" inch square table very nicely. It tucks in almost all the way, and doesn't have a backrest to block the view. Another nice thing is that you can sit facing any direction - where the Park Bench dictates sitting direction.